Disney Animation’s adaptation of the obscure Marvel comic Big Hero 6 arrives in theaters November 7 (check here for local release dates). The action-adventure comedy features the voice work of Genesis Rodriguez, Jamie Chung, Damon Wayans Jr., James Cromwell and Maya Rudolph among others. While you’ve probably seen the trailers, liked frequent Facebook updates, followed posts on Twitter and Tumblr, here are 35 things you probably didn’t know about Disney’s latest blockbuster. Oh, and by all means stay to the very end for an awesome end credits scene! 3. Though not a movie under the Marvel Studios umbrella, they were still supportive during the production process of the film. “[They] attended every screening, offering notes. They’ve never given us any guidelines other than to make a great movie. We’re all fans of Marvel with great admiration for their style of action and adventure, so we wanted to make sure that was deeply ingrained in our storytelling, along with the desire to make a film with the heart and humor audiences expect from Disney animation,” Hall said. 5. Hall and several members of the production team also visited a number of East Coast universities, including Harvard and MIT. The environments inspired San Fransokyo Tech labs in the movie. 9. For the film’s finale, the filmmakers consulted a theoretical physicist at CalTech. 10. The filmmaking team also did some serious research into grief, particularly how loss impacts someone Hiro’s age. Several members of the story team spent three hours with clinical psychologist Michelle Bilotta Smith. “I work with people who have experienced severe trauma and grief,” she said. “They wanted to know what a depressed kid would look like. What would his room look like? What would he be doing?” Smith says adolescents process loss differently than adults. 11. Nearly 700 unique characters populate the film. 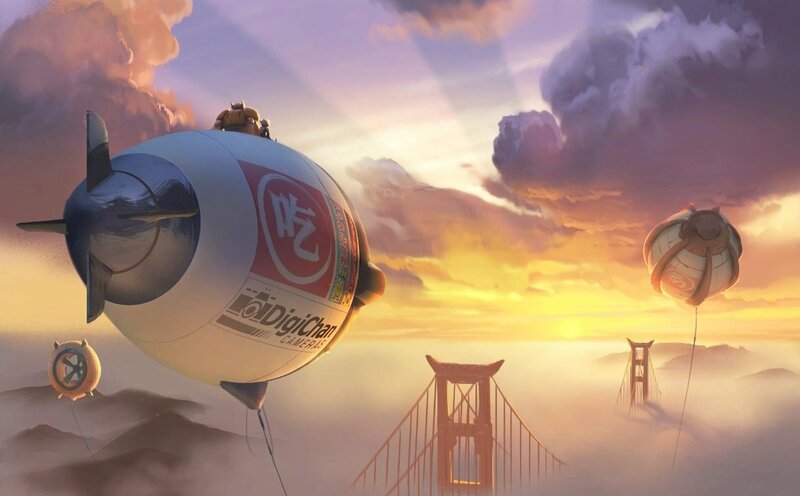 Considering Wreck-It Ralph broke the previous record in 2012 with 185 characters, Big Hero 6 is shattering the possibilities of background artistry. 12. Denizen was a proprietary system created within Walt Disney Animation Studios that revolutionized how artists could create and animate crowds. “In order to create and maintain those characters we needed to find a way to generate them procedurally so they could evolve as the show evolved and be created on the fly when needed,” character rigging supervisor John Kahwaty said. 14. Denizen created 670 unique characters, each one having 32 different clothing look combinations and 32 different hair and skin tones. When you crunch the numbers, that’s 686,080 unique character that can populate San Fransokyo before there are any repeats. 15. Walt Disney Animation Studios employees were encouraged to model themselves as background characters. As a result, 200 employees make cameos within the crowd shots in the film. 16. Lead character designer Shinyoon Kim spearheaded early exploratory drawings of Hiro. “Hiro’s hairstyle was inspired by a lot of things, but mostly Japanese teenagers – it’s a popular hairstyle in Japan,” Kim said. 18. Hyperion allows artists who specialize in lighting to focus on the art versus dealing with massive amounts of data. According to Walt Disney Animation Studios’ chief technology officer Andy Hendrickson, Hyperion comes closer to mimicking what happens in the world around us. 20. The software for Hyperion has been in the works for two years. 21. Baymax’s official job title is Personal Healthcare Companion. 23. Baymax’s vinyl design presented a challenge in lighting him. “We did tests with vinyl beach balls, then we set up the same test in Hyperion. The way the light bounced around the vinyl looked exactly like the reference we shot,” director of cinematography-lighting Adolph Lusinsky said. 28. At one time, Wasabi (voiced by Damon Wayans Jr.) was a very Zen character. 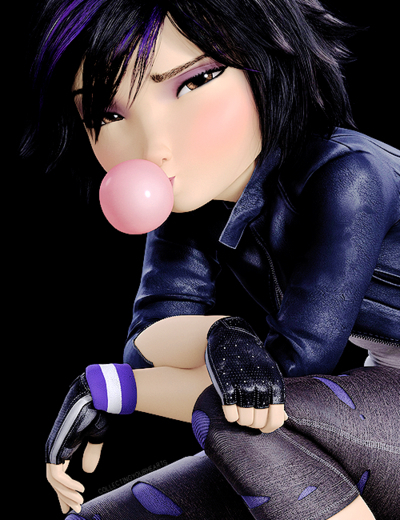 “Neurotic Wasabi was so much more fun to watch,” animation supervisor Nathan Englehardt said. When filmmakers tweaked his personality, they initially decided the neatnik wouldn’t be a fan of the dreadlock hairstyle and gave him a haircut. That look didn’t last as it turns out everyone was just too attached to his cool locks. 29. Genesis Rodriguez, who voices Honey Lemon, was once on a robotics team. 30. Filmmakers traveled up the California coast to visit San Francisco. “We spent three days just driving around the city, hitting the Golden Gate Bridge, Coit Tower, Market Street and Japantown,” Hall said. “We also spent some time on Angel Island.” The filmmakers viewed San Francisco from the ground, logging many miles by foot and also by air with breathtaking helicopter rides. “We literally wanted our setting to geographically be San Francisco,” Hall said. 31. In case you’re wondering what those large blimp-like structures that are floating above the clouds are, they’re wind turbines. San Fransokyo is powered by wind energy. 33. A graphic designer was hired more than two years ago to create the massive amount of designs needed to fill the vast city. 34. San Fransokyo Tech features Stanford mission architecture crossed with Japanese architecture. “We looked at campuses like Caltech where there is an original campus styled in the early 20th century and over the decades, it proliferates into other design styles,” Felix said. 35. Legendary comic book artist John Romita Jr. has a producer credit on the film. Tags: animation, Baymax, Big Hero 6, Damon Wayans Jr., Derrick Deane, Disney, Disney films, Disney movies, entertainment, family films, family movies, film, Genesis Rodriguez, James Cromwell, Jamie Chung, Marvel, Marvel comics, Marvel movies, Maya Rudolph, movies, San Fransokyo. Bookmark the permalink. The animators actually said in the extras on the movie that Baymax’s walk is actually modeled after a toddler with a full diaper. Not a penguin. Interesting. In the press notes, they had said they had modeled it after penguins, but perhaps there were a number of things they modeled it after.